If you happened to dream about a place as cozy as home, where you can relax with your family or friends, you need to look no further! Kanel Bar & Diner in downtown Sofia is a place for both special momentsand meeting friends over coffee. At our place, delicious food and pleasant time reign supreme. 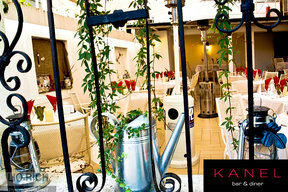 Once you step over Kanel Bar & Diner’s threshold, you’ll find yourself in a fairy-tale home of comfort and serenity. The unique taste in detail is all over the place - the beautiful red clothes hanger, the old piano, the decorative bike, and the shine polished metal dustbin are there to greet you with a wink. You can enjoy the cool splendor and flowery relaxation in the summer garden, which is heated in the nippy spring and autumn months. 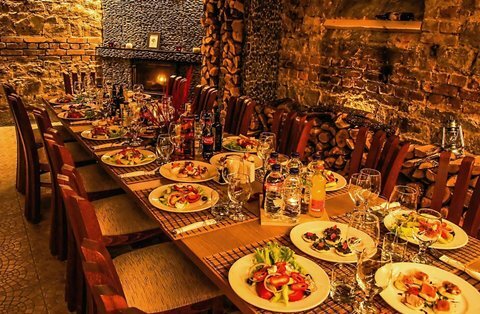 The wine cellar is always ready to welcome you with the aroma of natural wood and dimmed candlelight. 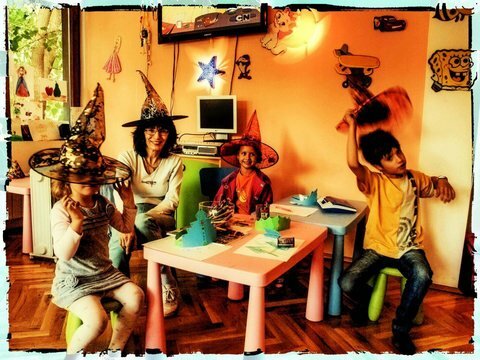 What is more, your kids will fall in love with the kids’ corner so much that you will be certain to visit us again. Whether you choose to sit by our home library, or take a stroll down the Italian street, or enter the photo gallery, you will be charmed by the timelessl allusion to a precious tranquility. Traditionalists and experimenters will both find the menu of Kanel Bar & Diner interesting. There is nothing better than starting the day with the aroma of home-made traditional banitsa, buhti with honey, fried bread, mekitsi, and black coffee - the breakfast which returns every Bulgarian to their childhood. The lunch menu will meet even the most pretentious demands for a varied and tasty lunch because it is different every day. The a la carte menu, which is rich enough by itself, is complemented by the seasonal spring, summer, autumn, and winter menus. Our service is in line with the interior of the restaurant – light, smiley, cozy, and fine-tuned to the last detail of your wishes. At Kanel Bar & Diner you can meet friends, spend a first date, and organize family celebrations, birthdays, children’s parties, company parties, Christmas parties, business meetings, and cocktails.